EBT examination of heart with calculation of coronary calcium score. Includes all interpretations and comprehensive report. High resolution low dose EBT scan of the lungs and chest interpreted by board certified radiologist. Report sent to patient and doctor with follow-up suggestions for abnormalities. CT Colonography examination of the abdomen/pelvis and colon “fly through imaging” with radiologic examination of complete colon surface for polyps, cancer, etc. Radiologic reports. Referrals to gastroenterologists if requested. Requires light preparation. * Note: Virtual Colonoscopy is covered by more insurance. Call FRPI for prior authorization. CT Colonoscopy, heartscan, lung screen, and abdomen/pelvic scan without contrast. 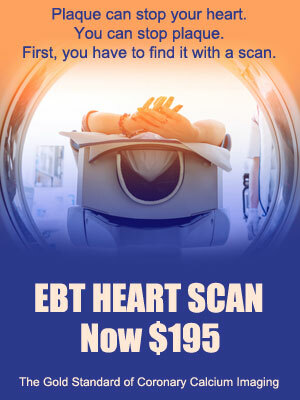 CT Colonoscopy, EBT coronary artery scan, with comprehensive reports. One of the best procedures for discovering your risk for stroke. Not Sure About Insurance Coverage? You may be eligible for coverage. Please see our Insurance Issues section.